Height is everything in the world we live in. The tall are physically imposing, considered more athletic, they can reach top shelves without standing on their toes and they can even access special dialog options in conversation! These are just jokes; but in anime, sometimes the aforementioned pros of increased height tend to be true. To prove this, why don’t we look at some of our favourite tall characters in anime? 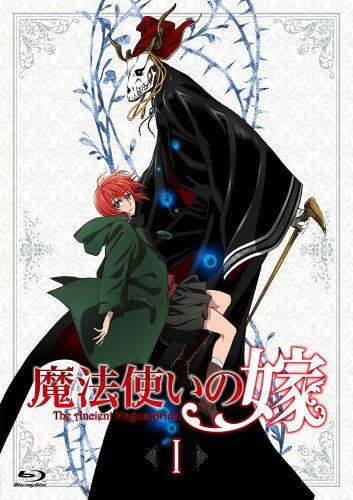 Hatori Chise is a 15-year-old Japanese girl who has completely given up her life and decided to sell herself to any buyer willing after being abandoned by her peers for eccentricity. Sold for 5 million pounds, Chise’s fate was uncertain. Bound in chains, she is led through a sleuth of robed gentlemen down a corridor leading to a study where her mysterious new owner, Elias Ainsworth, awaits. Introducing himself as a magus, he teleports himself and Chise to his cottage in rural England where he then expresses his desire to make Chise his apprentice in magic and eventually, his bride. Elias Ainsworth is an incredibly sizeable gentleman with a skull for a face. To this end, the enigma of his identity remains incredibly well-hidden. His purchase of Chise from the auction was so that he would have someone to inherit his magical ability and later become his bride and as a result, despite the fact that he literally owns her, Elias treats Chise fairly well… for someone who spent 5 million on a human being. Gouda Takeo is a tall and muscular high school student who stands out as a result of his massive stature. Despite his intimidating appearance, he has a heart of gold and is well-liked by his male peers for his courage and chivalry. However, despite this, he can’t seem to attract a girl to date and it doesn’t help that his massive size and intimidating features scare girls away. To add insult to injury, his best friend, Sunakawa Makoto, is incredibly handsome and adored by all their female peers – including every girl Takeo has ever liked. 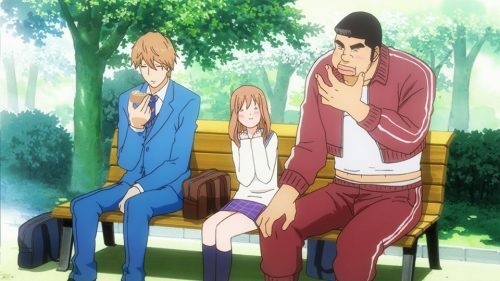 When Takeo saves the cute Yamato Rinko from being molested on the train on the way to school one day, she instantly falls in love with him; however, Takeo thinks that she might be interested in Sunakawa instead. Despite these thoughts, Takeo can’t help but fall in love with her, but continues to try to unite her with his best friend. At a staggering 2 meters tall at 16-years-old, Gouda Takeo is your quintessential gentle giant. His huge frame allows him access to incredible physical capabilities, such as high speed and great strength. His sheer size scares off just about anyone, so when he witnessed Rinko’s assault, he was well-equipped to step in and possibly scar the pervert into never doing such ever again. Ichinomiya Kou is the son of a wealthy businessman. The Ichinomiya family motto is to never be indebted to anyone, so when Kou falls from the Arakawa Bridge and a random stranger saves him from drowning in the Arakawa River, he finds himself owing his entire life to a stranger. He insists on paying her back; however, the blonde, stoic, tracksuit-clad homeless girl known as Nino lives under the bridge and wants nothing more than to fall in love. When Nino asks Kou to be her boyfriend, he has no choice but to accept – so Kou moves in with Nino under Arakawa Bridge! Amazoness is one of the homeless individuals living in an area slightly upstream from where Kou and the rest of the Arakawa gang live. She is a tall, muscular woman with blonde hair who wears a fair amount of makeup, particularly lipstick and eye-shadow. Initially antagonising the residents of Arakawa, she falls in love with Kou when he eats gari-gari ice-cream and gets a winning stick. After several efforts to get Kou’s affection, she gives up and ends up falling in love with Hoshi after he tried to cheer her up. 7. Haiba Lev – Haikyuu! Inspired after watching a volleyball ace nicknamed the “Little Giant”, the tiny Hinata Shoyo attempts to revive the volleyball club at his middle school and they even make their way to a tournament. However, they suffer a crushing defeat in their first and last match against a team led by the so-called “King of the Court”, Kageyama Tobio. Vowing to surpass Kageyama one day, Hinata graduates and joins Karasuno High, the school once attended by the Little Giant himself. However, to his shock, Hinata attends his first practice and finds the very same Kageyama who demolished his middle school team. Because of his tiny stature, Hinata struggles to find his place on the team; however, he is an athletic marvel and surprisingly, Kageyama turns out to be the key to solving his problems. Working together is the only way for them to bring Karasuno High to the heights of the game and make their team the best in Japan. 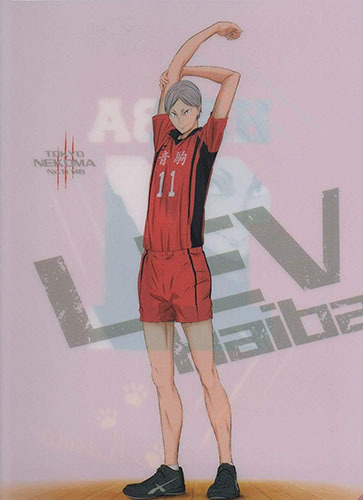 Haiba Lev is a first-year from Nekoma High, a rival outfit who have competed against Hinata’s team a few times before. At a staggering 194cm on his debut in the series, Lev is freakishly tall for a sixteen-year-old. This gives him quite the physical advantage over his peers and his long arms and legs are a major threat for any opposing side. Cheerful and childish to the point of offending people, Lev is just another high schooler playing the sport that he loves, hoping to make his team the best in Japan just like the Karasuno outfit is. With the appearance of supernatural abilities known as “Quirks”, humanity has changed into a superhuman society. 80% of all living people are reported to possess these special abilities and as a result, some use their powers professionally as superheroes. Midoriya Izuku is a middle-schooler with roaring dreams of becoming a hero like his idol, the Number One Hero, All Might, but he possesses no Quirk. However, when All Might reveals that his own Quirk can be passed on, he calls upon Izuku to take on the mantle and trains him so that he can enter U.A. High, the most prestigious hero school in the country. With his adventure beginning, Izuku soon learns about what it means to be a hero. All Might, the Number 1 Hero in Japan and legend adored by nearly everyone in society due to his incredible heroic feats. 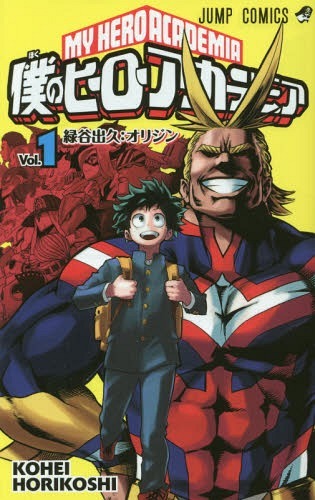 Izuku looks up to this man and wishes to imitate every single heroic detail of All Might, including his unwavering smile. At a massive 2.2 meters tall, All Might stands at over 7 feet tall! Even when he assumes his gaunt-looking, deflated appearance, All Might is still considerably taller than most of the other characters. Years after winning the World Martial Arts Tournament, Son Goku is living a peaceful life with his wife Chi Chi and son, Gohan. However, the peace is thwarted with the appearance of Raditz, an alien enemy who claims to be Goku’s brother. He reveals that Goku’s origins are elsewhere, the Planet Vegeta, the home of the virtually extinct Saiyan warrior race. Sent to Earth as a baby, Goku’s mission was to destroy all life on the planet in order to prepare it for sale; however, he hits his head as a baby, losing his violent Saiyan programming to become a kind boy willing to protect others. After failing to recruit his brother, Raditz warns Goku and his friends of a worse threat – two more Saiyans far stronger than Raditz who are en route. With danger on the horizon, will Goku and his friends be able to defend the Earth? Piccolo is a Namekian warrior who was initially the Demon King who terrorised Earth during the events of Dragon Ball. Defeated by Son Goku in his youth, the reincarnated Piccolo fights alongside the forces of Earth in order to defend the planet. 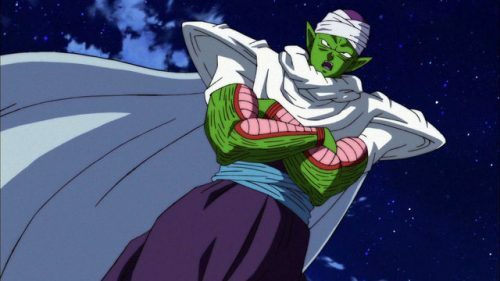 Piccolo, at a height of 2,2 meters tall (7’5”), is the tallest Z-Fighter and in addition to the reach that his height gives him, Piccolo can stretch his limbs, which can be devastating in combat. 15-year-old Kurosaki Ichigo has always been able to see ghosts. One night, a woman dressed in a black kimono named Kuchiki Rukia appears out of nowhere in his room, claiming to be a Shinigami – a grim reaper-like entity. She explains that her role is to guide lost souls to a realm known as Soul Society, while also purging evil spirits known as “Hollows”. Sceptical at first, Ichigo’s suspicions are quickly deadened as his family is attacked by one such Hollow and Rukia is gravely injured. With their fates all but sealed, Rukia suggests a daring plan: she will attempt to transfer her Shinigami powers to Ichigo so that he may then slay the beast. From that day forth, Kurosaki Ichigo took on the mantle of a Shinigami, changing his life forever. Captain of the battle-loving 11th Squad of the Gotei 13, Zaraki Kenpachi holds the Kenpachi title for being the strongest fighter in all of Soul Society. 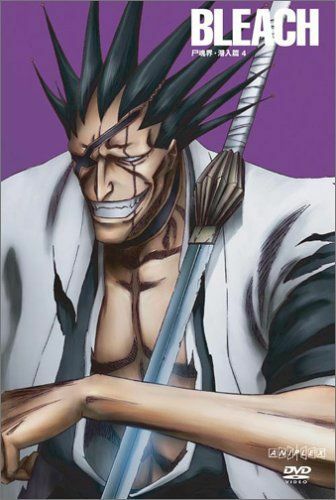 Not even knowing the name of his Zanpakuto, Kenpachi causes incredible devastation to his opponents despite not even reaching half of his potential as a Shinigami. In addition to his massive Reiatsu (Spiritual Pressure), Kenpachi is quite the sizeable man at 6’7”. His high-reaching hair probably adds substantial height to his already massive frame. Centuries ago, humanity was brought to the brink of extinction by giant humanoid creatures known as the Titans, which devour human beings. Hiding behind a thick trio of concentric walls, humanity experiences 100 years of peace without incident. However, one day, a massive Titan looms over the outermost wall and tears a huge hole, unleashing a Titan horde on the town of Shiganshina, reviving humanity’s fight for survival. After witnessing his own mother’s death at the hands of a Titan, young Eren Jaeger swears to eradicate them all, enlisting into the Survey Corps, a military unit tasked with combating the massive beasts outside the walls. With the fate of humanity in their hands, Eren and his friends Mikasa and Armin join the war against them in order to preserve the human race. The Colossal Titan – identity now confirmed to be *****. 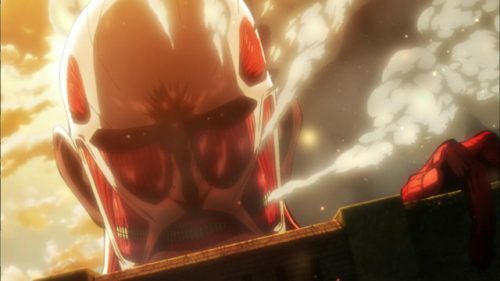 At a gigantic 60 meters tall, the Colossal Titan is the tallest Titan seen in the series, at least until the third season and the visage of the Colossal Titan looming over the wall is a moment in anime that could go down to be remembered for a long time to come. Wait, you didn’t think we’d actually tell you who it actually is, did you? Gol D. Roger was the most infamous individual to have sailed the Grand Line and earned himself the title of “Pirate King”. However, when the World Government captured and executed him, the world was changed forever as his last words revealed the existence of the One Piece, the greatest treasure in the world. This brought about the age of pirates as people around the world wanted to be crowned with the glory of finding the mysterious treasure and become Pirate King. 17-year-old Monkey D. Luffy decided at a young age that he would become a pirate out of a strong sense of adventure and aims to one day find the One Piece, travelling across the Grand Line with his own pirate crew. However, the journey will be long and there will be many, many dark mysteries and powerful enemies along the way. Considered the most beautiful woman in the world, Boa Hancock is the captain of the Kuja Pirates and the only female member of the Shichibukai. Standing at a tall 6’3”, she is fairly tall by real-life standards. Boa Hancock is the current empress of the Kuja tribe of Amazon Lily, known to them as the Snake Princess. Her beauty is apparently second only to the mermaids; however, that beauty is directly proportional to her incredible strength – her bounty stands at a staggering 80 million beli; after her first campaign as a pirate. Scary. The Holy Knights of Britannia of the Kingdom of Liones are users of incredibly powerful magic that they use to protect Britannia. However, a small squadron of the Holy Knights betrayed their kingdom, attempting to overthrow the ruler of Liones. Their insurgence was suppressed by the Holy Knights, but rumours of the survival of the “Seven Deadly Sins” persists. Ten years later, the Holy Knights staged their own revolt and became the new tyrannical leaders of Liones. 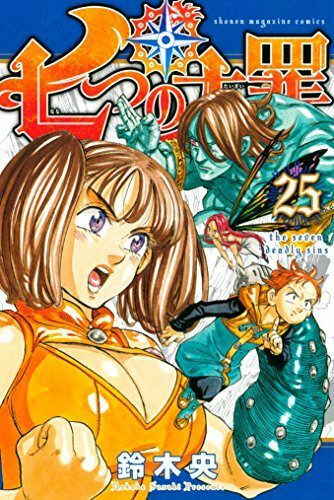 Elizabeth, the kingdom’s third princess, sets out on her own to find the Seven Deadly Sins and ask for their help in order to take back the kingdom and restore justice to the Kingdom of Liones. Diane, the Serpent’s Sin of Envy. As one of the few remaining giants in the series, Diane is naturally a character worth considering for a list like this one. Her main traits are her jealousy and her envy, which are greatly manifest when she sees how close Meliodas is with Elizabeth. Her height? 5’5” – in her human form, anyway. As a full-on giant, Diane stands at a height of over 9 meters – just over 30 feet tall! For many characters on this list, height gives a considerable advantage over the other characters in their respective universe. For others, however, their height is nothing more than an aesthetic fact about the character. 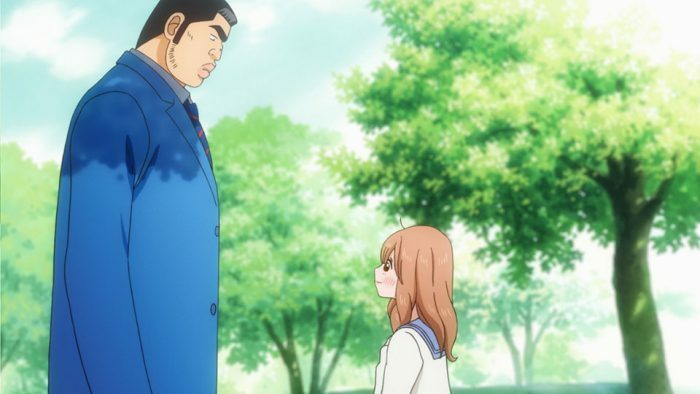 Whatever the case may be, tall characters in anime are innumerable and to that end, there are several tall characters we simply haven’t mentioned. That’s your cue – drop a comment below and tell us who your favourite tall anime character is!